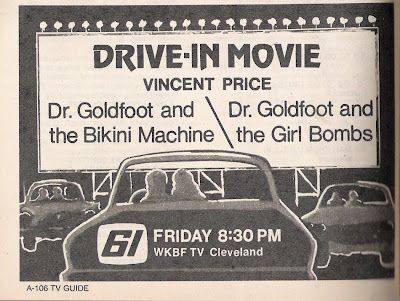 WKBF-TV broadcast the NBA Cincinnati Royals TV Games in at least the 1967-68 season' Notice the full channel 61 logo notating, "Kaiser Broadcasting"
October 1973 Friday Night "Drive-In Movie" Ad for a Vincent Price Double Feature..Very Campy Stuff Indeed.. However, the Story of Cleveland's first independent station goes back to 1958, whe the Henry J. Kaiser Corporation bought KULA-TV 4 in Honolulu, Hawaii..After changing the call letters to KHVH, Kaiser sold the Honolulu Station in 1965 to finance expansion in the US Mainland through construction permits for several UHF stations.. In December 1966, Kaiser partnered with the Boston Globe in buying long dormant Channel 56 (WKBG) in Cambridge, Mass. (Boston) (Now CW 56). 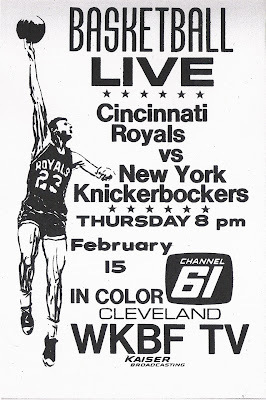 The station had some sports such as Cincinnati Royals NBA Basketball and the World Football League (1974) They also had the area's first 10:00 PM News under News Director Alan DePetro with the late John Herrington, arriving from Kansas City. Herrington then would spend 23 years at WKYC-TV 3..
Kaiser was unique, too in that it had the same "look" for all their station logos..Block white letters inside a black TV screen..
With WUAB-43 showing up in Sept. 1968, things becsme difficult financially for both as Cleveland supposedly couldnt support 2 full power independent stations..WUAB came out with more sports and local programming from the start..Kaiser bought a share of WUAB-TV from United Artists in 1975..By April 1975, WKBF was shut down and its programming was merged into WUAB-43, under United Artists Control.. The Kaiser stations were eventually merged into Field Communications of Chicago, owners of WFLD-32..
Channel 61 was a great idea for its time..I wish it could have held on..Was nice to have more than one Independent to choose from..
Informaton from various Wikipedia articles..Schedules and Ads from TV Guide Cleveland Edition..
Tim, the reason KBSC/52 in Los Angeles never amounted to much is pretty much the reason Kaiser was so successful in most of its other markets ... being either the first or second independent in those markets. When Kaiser bought KMTW, there were already four independents in the Los Angeles market, and all were VHFs. Buying a Los Angeles station may have been the only true blunder they made, because they were stuck with a program schedule that attracted only limited viewership. KBSC never signed on before 2:00pm, which was already unusual in L.A. in the early 1970s (their only companion in waiting until mid-afternoon to begin the broadcast day was Spanish-language KMEX/34). They had cartoons that either never had aired in L.A. or had already been aired to death on the Vs (Speed Racer, Gigantor, Kimba the White Lion), Little Rascals and Three Stooges shorts, and a library of forgettable B-movies run as "Hollywood Television Theatre" (and often, with few or no commercials, since KBSC was primarily just trying to stay on the air for the then-required minimum six hour broadcast day and had sadly little advertiser interest. They did, of course, run Lou Gordon on the weekends. Their fortunes picked up somewhat in the late 1970s when they were able to broker time to a company that imported Japanese dramas and news programs, but that ended quite abruptly when they were sold to Oak Broadcasting to become subscription service ON TV. As Paul Harvey would say, now you know ... the rest of the story. Really excellent to hear from you..Thanks for the Insight..Speaking of which, I miss you around Radio Insight.com. Hope you are doing well and thanks for stopping by..
KBSC 52 was orginally KMTW which was owned and operated from its inception in 1965 by Kaiser Broadcasting. Kaiser originally intended for it to be a Subscription TV station playing first run movies, theatrical and sporting events, but it never happened most likely because few TV sets in that era picked up UHF brodcasts. In January 1966 Kaiser changed the call letter to KBSC. Kaiser than programed it and it became LA's fifth independent station. Its failure to generate an audience was because of the lack of programming available. Ironically after Kaiser sold KBSC to Oak Broadcasting in 1978 it nbecame the LA outlet for ON Subscription Television. In the early 80's ON merged with it competitor SelectTV and soon afterward went defunct as the metro LA area received cable TV. KBSC was is well know and loved by those of us who were children during the late 60's and early 70's. WKBF TV61 went on the air on my sister's 10th birthday, January 19,1968. I believe that Northeast Ohio could've kept both Channel 61 and WUAB TV 43(owned by United Artists Broadcasting, a part of Transamerica)if Kaiser would have put as much money into it as it another one of its stations that I got to see during the clear summer days,WKBD TV50 in Detroit. Channel 61's biggest opportunity came in 1970,when the Cleveland Cavaliers joined the NBA. The first year TV rights went to WEWS, an ABC affiliate. Because of their affiliation, they couldn't show many games. WUAB not only got the Cavs, but they scored by getting the new WHA(World Hockey Association) Cleveland Crusaders. Meanwhile, in Detroit, Kaiser managed to get the Pistons and the RedWings for WKBD.I had hoped that WCLQ,the next 61,would have survived, but,by then, WUAB was far too strong. They may had lost the Crusaders, but they did get the Cleveland Indians. I have a WCLQ t-shirt. I only wish I had a WKBF one. WKBF TV61 will always be my favorite because it was my first independent station.